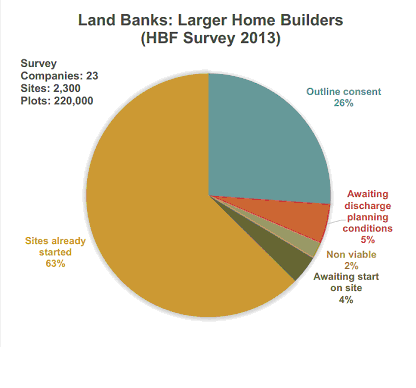 Interesting new Report attempts to debunk land bank myth – are developers really hoarding land? For years, large property developers like Barratt Homes have received much criticism for so called ‘hoarding’ land, a process by which they buy vast numbers of plots with full or outline planning permission, but actively choose not to develop them. Naturally, with Britain’s housing supply estimated to be hovering at around half the number of new properties per year it needs to be able to satisfy current demand, any act of reducing development by restricting the available areas for it is bound to be met with hostility. It can be argued that such actions keep land off the market, drive up prices – with an obvious benefit to developer’s profit margins – and force buyers out. 63% are on sites where construction work is underway. Large sites with thousands of homes will obviously take years to build out and homes on such sites will be at various stages in the construction process. 68,500, or 31%, are on sites with only an outline permission – so builders legally cannot start building – or on sites where building is held up awaiting local authority discharge of planning conditions. Extrapolated out across the whole industry, this means around 185,000 plots are currently in the planning system but cannot yet come into production. This indicates that, although developers might be criticised for not attempting to convert more of their outline permissioned sites into active permissioned sites, the reality is that they are actively pursuing the lion’s share of the plots they own – the process simply takes time, for large sites sometimes several years. Crucially then, the argument goes that hoarding a certain amount of land is an absolute essential, to show investors that production will not imminently ‘fall off a cliff’ and that the company is therefore a worthy prospect. Without investment, developers would fail and no properties would be built – with the exception of any constructed by the public sector. “This report is just the latest of many to debunk the myth that home builders hoard land. When you look beyond the rhetoric and the lazy accusations, the facts are quite clear: house builders do not hoard land or landbank unnecessarily. The debate really needs to be about how we get the land in the planning system through more quickly to build the homes we need and not about myths. “The planning process is complex, bureaucratic, costly and time consuming. As a result, house builders have to have a pipeline of land coming through the planning system to enable them to plan their businesses. “If we are to see a sustained increase in housing supply we need to see more sites coming through the planning system. Unblocking the planning system and processing applications more quickly will be crucial. There are currently around 185,000 potential homes in the system. Finding a way to get these through the system more quickly must be a priority for Government if it wants to get the homes built the country needs. Some would argue, therefore, that the problem is not with the developers, who do what they must to keep construction flowing, but with the planning system. Whilst the concept of reducing red tape and regulations to improve the flow from outline to consented permission sounds a good and simple one, the reality is more complex. The National Planning Policy Framework was only recently introduced, reducing thousands of pages of guidance to just 50 or so. A presumption in favour of sustainable development has already been introduced, to be a ‘golden thread’ through all planning policies in the UK – local and national. Much has already been done to unclog the system then and, whilst encouraging development is undoubtedly a broadly reasonable goal, reducing the planning system yet further would diminish the controls which ensure that development is appropriate and sustainable. Whichever course of action this Government and the next decide upon, at the very least this report serves to show that each story can have two sides and even the strongest urban myth can be debunked.